What’s Inside the 2019 Jaguar F-PACE Interior? The 2019 Jaguar F-PACE is renowned for its sporty exterior and race-inspired performance, but what about its cabin? Coto De Caza drivers expect nothing less than high-end luxury from a Jaguar, and that’s precisely what the F-PACE delivers. Learn more about the Jaguar F-PACE interior features and cargo space below! Although compact, the new F-PACE doesn’t skimp on comfortable seating and generous cargo space. Inside, you’ll find seating for five people across two rows. With the rear seats in place, the Jaguar F-PACE offers 33.5 cubic feet of cargo space. If you need additional interior space for beach gear or a surfboard, the folding seats can be repositioned for up to 64 cubic feet of cargo room. 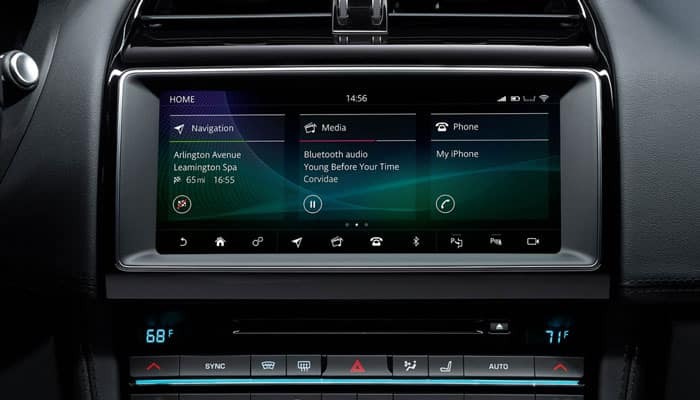 InControl Touch Pro™: Touch Pro™ is standard, and includes a 10-inch touchscreen, a Meridian™ Sound System, and an instrument cluster with a 5-inch central TFT display. Optional InControl™ Apps: InControl Apps™ connects to your compatible smartphone, so you can control your favorite apps from the central touchscreen. Optional Head-Up Display: With the optional Head-Up Display, you can view speed alerts and navigation directions right on your windshield. 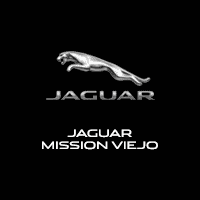 Test Drive the New F-PACE at Jaguar Mission Viejo in Mission Viejo! 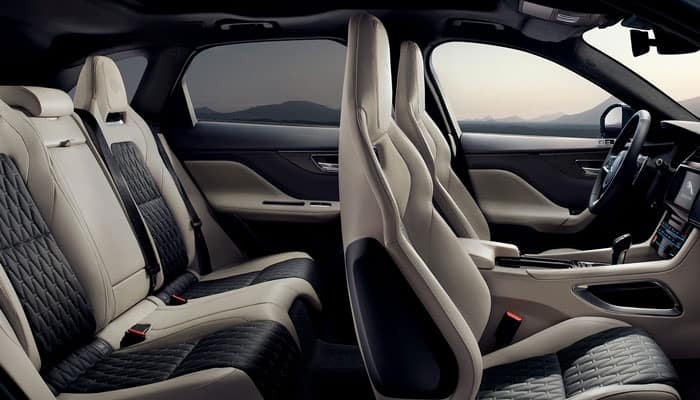 Experience the 2019 Jaguar F-PACE interior from the driver’s seat at Jaguar Mission Viejo! Contact us to schedule a test drive near San Juan Capistrano and San Clemente. While you’re here, be sure to ask about our new vehicle specials, F-PACE lease offers, or SUV lease deals. 0 comment(s) so far on What’s Inside the 2019 Jaguar F-PACE Interior?